The Nissan Qashqai ‘What Car 2014’ Engineered by Nissan with Siemens NX & Teamcenter PLM Technology supported by TEAM Engineering. This case study covers Nissan’s use of NX CAD|CAM|CAE & Teamcenter PLM. TEAM are a specialist Siemens PLM business partner, providing solution sales, deployment, training and support. 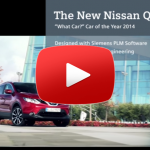 Feature: Nissan Qashqai – Siemens NX CAD|CAM|CAE & Teamcenter PLM Case Study.